The Powerful Coaching Conversation Workshop is a practical, hands-on training experience for leaders seeking to become much more coach-like in all of their interactions. Questions? Call toll free 888-221-8685 or e-mail info@bluepointleadership.com. The Powerful Coaching Conversation is an intense 1-day leadership workshop designed to provide participants with a strong foundation of coaching principles and practices. The workshop equips individual contributors, frontline managers, and early-stage leaders with skills and approaches they can use to have a significant influence on the performance, learning, and careers of others. 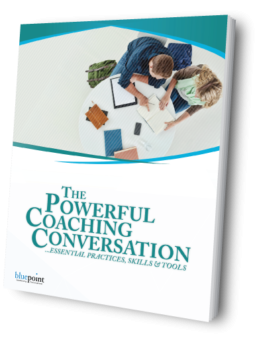 Post-Workshop support available for The Powerful Coaching Conversation! This includes a 12-week Micro eLearning Program powered by Mindmarker. The micro eLearning program includes a series of strategically-designed messages that are sent to participants two to three times a week for several months following the workshop. A sequence of videos, podcasts, quizzes, surveys, and assignments help participants refresh and deepen their understanding of workshop concepts, reflect on their current leadership practices, and make real, sustained change in their day-to-day behavior. Call toll free 888-221-8685 or e-mail info@bluepointleadership.com for more information. Bluepoint’s leadership development programs have always been designed to help leaders make real, sustained change in their day-to-day behavior. Our leadership and coach-training programs routinely utilize innovative instructional designs and the latest research in adult education, social learning, and virtual learning. With the launch of Bluepoint’s New Micro eLearning Programs, we are excited to take our post-workshop support to a whole new level by providing our clients with three new ways to maximize the effectiveness of their chosen program and support their leaders’ efforts for sustainable behavioral change. Micro eLearning enables participants to more easily absorb and retain information by offering short, focused lessons, which are designed to reinforce concepts from the workshop and challenge participants to apply their personal learnings in order to create lasting behavior change. Bluepoint’s leadership programs are not typical skills-based training programs but rather transformational experiences that produce extraordinary managers and leaders. Based on proven, well-researched methodologies and content, Bluepoint workshops provide peace of mind that your investment will deliver solid behavioral and business results. These intense, challenging, thought-provoking workshops are designed to have an immediate and lasting impact on performance, engagement, and alignment. Bluepoint workshops employ a wide variety of engaging educational activities, including peer coaching, video case studies, stories, presentations, competitions, debates, print materials, and experiential exercises, which are all designed to maximize participant engagement.